Let’s get real about your sales people, consultants and account managers in the travel management space. Your contracts should do the heavy lifting, but great sales people can make an enormous difference in your program. You have far more leverage than you think. Here’s a test: are you courageous? Curious? Assertive? Then how often do you tell your friends and colleagues when their out-of-office email or voicemail is out-of-date. Judging by how long some of them remain active I’ll risk offering that we don’t do it enough. We think we’re more assertive than we actually are, but HOPE could improve this situation – Help One Person Everyday. So the next time someone’s out of office is expired – be assertive and let them know. Hope is often applied to managed travel – the other kind of hope. We hope that travelers will comply with our policies, we hope our CFO understands why rates go up, and we hope that we’ll have the best sales people, account managers and consultants assigned to us. Travel Management is notoriously lax at holding people accountable. For most airlines it’s nearly impossible to identify and measure sales teams against a metric they control that flows to profitability. All too often they’re not held accountable. Consultants are often treated the same way – many people act as if one is as good as the next. Experience proves otherwise. In the hotel and airline business awards are often given to the sales person responsible for customers in an industry or location that’s growing while scorn is offered to the person living and working in a declining market. This is where Travel Managers come in. Great account managers can be found anywhere (even declining markets) and you’re just as likely to find mediocre performance in growing markets. You must provide feedback to enhance your program and to serve your customers better and you do that by being part of the assignment process. This is where assertiveness is important. Successful programs rely on great partners. Those partners develop and contribute outstanding account managers. Those managers share three qualities that you should focus on: 1. Competence; 2. Initiative; 3. Fit. All three are necessary for a best-in-class program. Competence: combines a thorough understanding of the market, customer, products, policies, and procedures. Competent Sales people listen and ask questions before making sound recommendations. This can be improved with training and experience. Initiative: take the appropriate action to solve or prevent a problem. These people are responsive – they’re on top of issues and have a sense of urgency commensurate with the situation. Improvements in this area often requires an attitude change – it’s more difficult to improve than competence, but good customers shouldn’t bear too many mistakes that thorough talent selection could solve. Fit: Often overlooked, but personality characteristics and nuances are important to develop respectful, trusting relationships. Your account manager or consultant should be someone you enjoy working with and you should be comfortable around them. Too often Travel Managers tolerate bad behavior from account managers – they don’t return calls, they’re dressed inappropriately for meetings, they are slow to respond to problems, they have a sense of humor that is offensive to others. The list goes on, but sometimes what works with a few customers doesn’t work well with others and you shouldn’t tolerate it. Great account managers should hold customers accountable for their performance too – but sometimes everything else being equal, the fit just isn’t there and when it isn’t you should take action. You get what you reward – if you make it a priority to gain one excellent airline sales person and two or more outstanding Hotel sales managers each year on your terms, you would very quickly build a network that will delight your travelers and make your job easier. You can even make freedom of choice part of your RFP process to tie it to something positive for the vendor. Asking for sales people by name is very easy. But how do you get their name in the first place? I’ve discussed this problem with a few friends in the medical field and their example is instructive. How do you pick a great surgeon? You don’t find the best one by asking another doctor – they’re rarely in surgery together. Anesthesiologists and surgical nurses have a small consideration set. That brings us back to medical device sales people. They see many surgeons as they operate and they have more evidence and better experience to give you an educated referral. Great consultants, sales people, and account managers can be identified through your network – ask your peers and your suppliers’ sales leaders which sales person or consultant they admire or they have heard frequent compliments about from shared customers. travel industry sales leaders generally have a larger customer network since they manage teams and are exposed to most of the largest, high touch customers in their area. It’s also helpful to understand that sales and consulting leaders maintain balanced territories – so if you don’t ask for someone by name, you’ll often be assigned the person who is available, and good people rarely have a light load. Consultants will have a larger impact on your program; it’s acceptable and I recommend that you ask about your consultant’s training and experience before a project or contract is implemented. Suppliers don’t offer different price points based on the team they assign to support you and you have a right to make requests related to this part of their offer. Due diligence about your vendor’s personnel is your responsibility, and the management leaders who do this well will achieve championship results. At first glance there’s no secret – airlines exchange higher share for better discounts. This seems easy enough, but there are a few things going on behind the scenes that smart corporations know and will use to their advantage to secure higher savings rates. Well managed travel programs are all the same. They have strong management teams and their policies and practices are aligned with business goals and traveler service. They generate “duty of Loyalty” – employees are driven to comply with policies because they receive excellent service; their travel management team is partnered with them to achieve each travelers business goals. Airline customers come in all shapes and sizes, but a single number cannot tell the whole story. 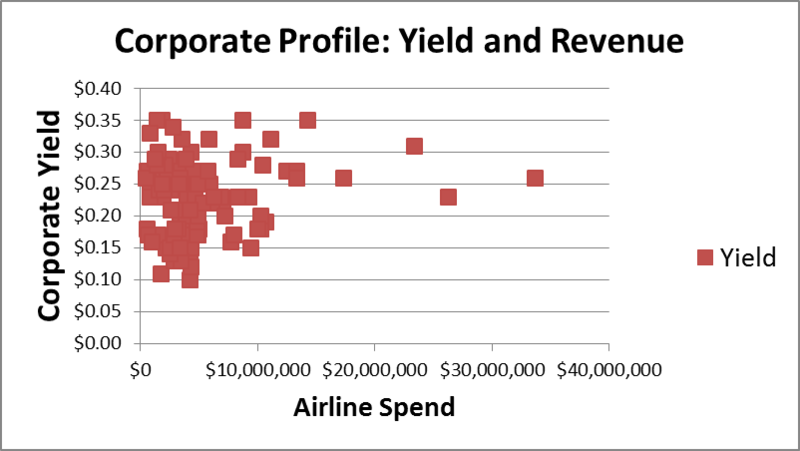 Airlines capture a lot of data, but four numbers standout to describe a customer: 1. Yield (average revenue per seat mile); 2. Premium share (Percent of revenue above (below), the carriers fair market share (FMS)); 3. Total spend (revenue to airlines); 4. Customer concentration (Percent of traffic in markets the airline serves). 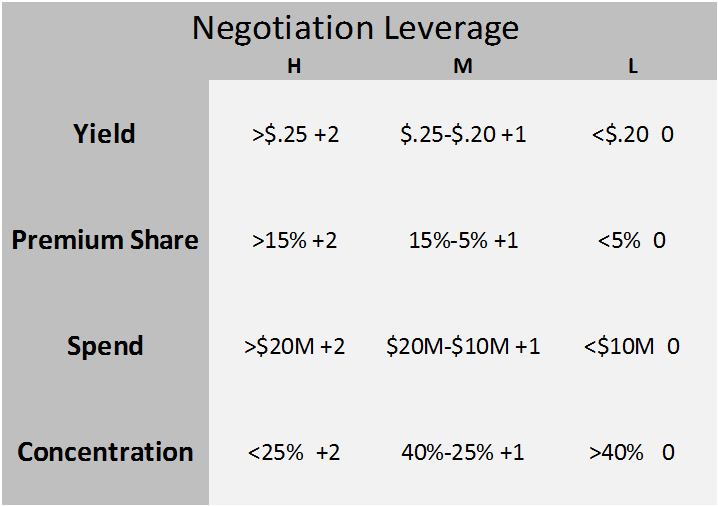 This article will offer a simple scoring system corporate customers can use to determine how much leverage they may have in negotiations with their preferred airline suppliers. Good airlines create detailed reports to measure the health and profitability of their corporate contracts. Major network carriers have 1,500 – 4,500 managed contracts in place, with another 5,000 – 30,000 agreements serviced through corporate loyalty programs (American – Business ExtrAA, United – PerksPlus, Delta – SkyBonus , Southwest – SWAbiz). 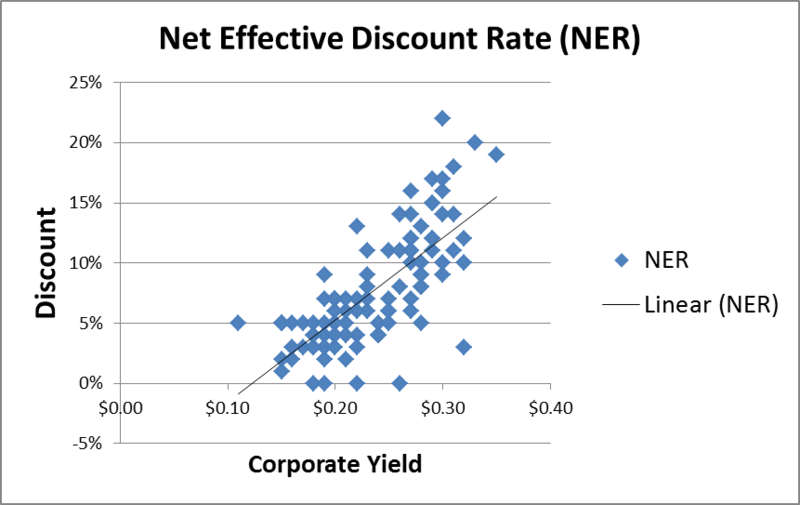 Airlines would keep a close eye on trends that correlate the Net Effective Discount rates (NER) to the Yield and Revenue of a particular client. A rational and financially savvy sales team drives profitability higher by controlling NER’s across industries or clients with similar spend patterns and size. Outliers are analyzed to determine if a particular team or sales person offered higher discounts than necessary to secure preferred carrier status. Additionally, sales support and analysis teams pay attention to specific customer issues. As an example two consumer packaged goods companies have similar travel policies and total spend might, but warrant different discount levels based on their travelers’ compliance and support for their preferred carriers. Travel managers in the same industry would be disappointed if they expect equal treatment and ignore differences beyond size and policy compliance. Airlines use sophisticated modeling and regression analysis to determine if their programs are working as designed. They produce graphs similar to the one below to share internally and use as a framework for strategy discussions about discounts and commissions. A simple scatter plot that contains data for the carrier’s top 100 clients might look like the graph above. The point on the far right depicts a corporate client that produced $35M, at a $.25 yield. It’s a large customer, but not an extraordinarily high yield. Notice there are several customers at or just above a $.10 yield. They are unlikley to receive industry leading discounts, but these customers can take steps to secure better discounts. In the next graph the airline’s management team would look for a low slope angle and points clustered around the best-fit line. The slope indicates the relationship between yield and the customers’ discount levels. The lower the slope, the less sensitive to discounts higher yields are, while a high slope indicates that as yield rises, discounts are likely to increase rapidly too. Again, this is sample data, but it should give you an idea about how your program is viewed by your preferred vendors. Additionally corporations without a contract should be able to achieve a savings rate at least as high as available through a loyalty program, so I’m always amazed to see NER’s below the 5% line (a typical valuation for SkyBonus or Business ExtrAA). Travel Managers should evaluate their program’s performance to establish realistic goals as they position their company and their Travel Management partner to launch an airline RFP. At this point, trust and respect between your team and the account managers and sales people at each supplier are vital for a smooth negotiation, but an honest appraisal can jumpstart the process and show you areas where your suppliers may expect work on your side to achieve your RFP goals. Travel Managers who understand the airlines point of view and have strong influence over the qualities that matter will be rewarded. 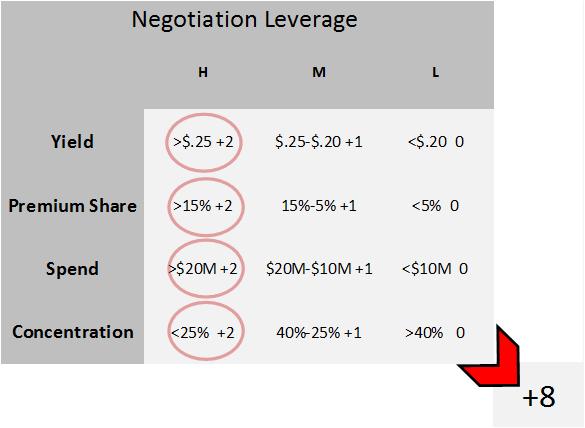 Here’s a model I developed to determine how much leverage you have as you begin the negotiation process. Yield: Begin here. More than $.25 give your program two points. You have a travel policy that likely includes a healthy combination of domestic first class, some International flights (in business class), and a decent percentage of domestic coach-class, business fares. If you achieved this primarily because your headquarters office is in Boston, and your team flies to New York, Laguardia on the shuttle, exclude that data for this exercise. And for those companies that have a combined yield below $.20, don’t try too hard with the airlines, you’re already doing a great job – your travelers buy coach, and they book at least seven days out (no points). Everybody else, between $.20 – $.25 give yourself one point. Premium Share: This is the one that separates well-managed programs from also rans. Does your travel team have the ability to influence travelers vendor choices? If you can answer yes – you have leverage. Do you enforce contracts to do the heavy lifting or do you need constant support from vendors each time a traveler finds a lower fare online or a checked-bag disappeared? Honesty here will uncover opportunities to drive incremental savings, but more of the same if the same means high maintenance then you will have a difficult negotiation. If you’re a bank or a movie studio and you give one of the legacy carriers an unbelievable share above their Fair Share or Seat Share in the LAX<>JFK market, then you get two points. If you’re based in Atlanta Delta earns all of your business, don’t get too excited, but I would still give you two points here (we’ll address this more in Concentration). For everyone else, use your judgement. Spend: Are you a big hitter? Does your company spend more than $1BN each year on air travel (you know who you are), than give yourself two points – you’re big enough to dictate some terms. Even if you spend >$25MM and you have a well-managed program you’re likely to have more leverage than a smaller program. 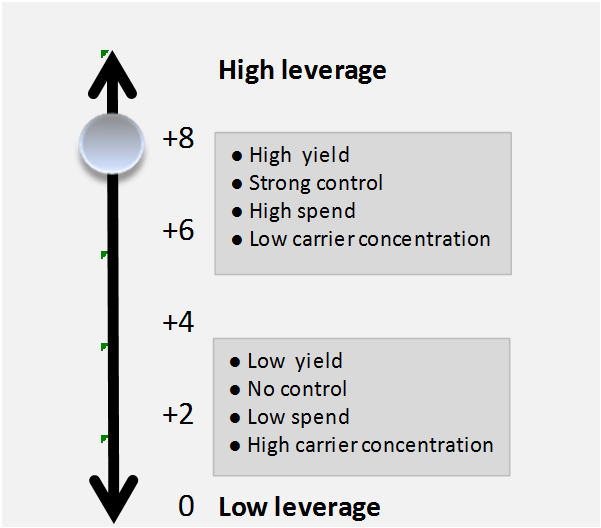 Concentration: This one is more subjective than the others, but if more than half your spend originates or ends in a fortress hub, you should score yourself lower. A company with operations in New York, Los Angeles, Chicago, or any number of up-for-grabs cities will find that this will give you leverage to negotiate better terms with your vendors. Here’s an example – If you combine low concentration, high premium share and high yield you will find yourself in a rare position and should expect industry leading discounts – even if you have a relatively low spend ($5MM). Carriers should fight over this business and the winners would expect to receive profitable traffic. The graph above depicts the best customer – one that can dictate terms and may be able to include “most favored” status in parts of their contracts. Any score above five would put a corporation in an excellent position as they negotiate with vendors. Four or below leaves room for improvement, but you should distinguish between values you can control and those you cannot. Total spend is something you’re unlikley to have influence over, but premium share is. Travel Managers have a significant influence over the premium share variable, and travel policies are yield’s biggest drivers. Before any negotiation you should determine which avenue for savings would be more effective a policy change or carrier discounts. Remember four constituents should be delighted at the end of the process: travelers, corporations, airlines, and travel management partners. Imagine a dashboard that could show you how much carbon dioxide your travelers generate every day. It’s actually a straight-forward problem and one I’ll try to solve for you today. Information about aviation fuel economy isn’t very accessible, but there are good clues and accurate data is easy to capture. Your frequent flyer account will keep track of the miles you’ve flown, but it’s impossible for most people to connect the dots to determine what their trips cost. Not in dollars, but in fuel, or in CO2 emissions. 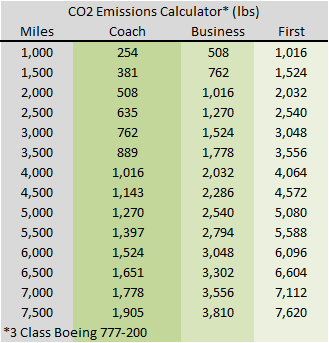 In a previous article I calculated “mileage” rates for aircraft by cabin and type of plane (single aisle or twin aisle) “The Secret Behind Airline Fuel Surcharges.” In this report I’ll show you how much Carbon Dioxide a particular flight created and give you a quick, easy-to-use grid to provide travelers with information about the carbon footprint their choices make. Just when you thought you wouldn’t need to remember anything about High School chemistry…actually you don’t. I’ll lay out the chemistry and math to solve this problem. First, Jet Fuel, or Jet A, contains a blend of different carbon-based molecules that combine with Oxygen to generate heat and pressure that jet engines convert to thrust. For simplicity, I’ll ignore the blend, and assume that “Octane”, a string-like molecule that contains a backbone with eight carbon atoms and eighteen Hydrogen atoms along the sides and endcaps, is a good proxy for everything else in the gas tank. During the combustion reaction, each carbon atom will combine with two Oxygen atoms to form Carbon Dioxide (CO2), while the Hydrogen will also combine with Oxygen, but their marriage yields water (H20). The reaction balances when two Octane molecules react with twenty-five Oxygen molecules (O2) which contain two Oxygen atoms. The exhaust product contains sixteen Carbon Dioxide molecules and eighteen water molecules. Here’s the equation: 2 C8H18 + 25 O2 -> 16 CO2 +18 H20. This detail isn’t useful until we convert molecular weights and ratios into terms that people are more familiar with. In this case, jet fuel weighs about 6.5lbs per gallon, and that mass is 81% carbon. We already know that our Octane molecule will split to form water and CO2, but the result most people struggle with is the conversion to weight. Specifically, Oxygen is heavy, about a third heavier than Carbon, so when each Carbon atom combines with two Oxygen atoms, the resulting molecule, CO2 is four times heavier than the Carbon atom by itself. This means each gallon of jet fuel (6.5lbs) will combine with 23lbs of Oxygen and turn into twenty pounds of CO2, and just over nine pounds of water! How much CO2 does a Boeing 777-200 create on a flight between Chicago and Hong Kong? Let’s work through it – fuel is a liquid, and measured in gallons, but the exhaust is a gas, that’s why we use weight rather than volume to describe the output. I calculated the 777-200’s gas mileage in a previous post here. At .1836 miles per gallon, a 7,821 mile flight needs 42,000 gallons. The flight would generate 851,000lbs of CO2. That’s 30% more than the maximum takeoff weight on departure, including the plane, fuel, passengers and cargo. The table below contains a comparison among cabins and shows passengers, fuel burn and CO2 emissions. A few years ago, when TelePresence was the newest thing and threatened to upset the airline universe, I had many conversations about the ways virtual meetings could become a viable substitute for air travel. In the real world, physical presence is irreplaceable, but the latest conference tools do offer a better way to conduct business and give you control over more of your time for certain tasks. As tools evolve we should use them to improve the clunkier practices in use today. This article throws recruiting into the blender for a business process makeover. Talent Management leadership describes the two highest payoff tasks every manager must navigate (in order): 1. Get the most out of their existing teams; 2. Find the best people to fill openings. Effective selection strategies begin with an assumption that it’s possible to measure candidates in a meaningful and predictive way that will allow managers to choose the best person among a strong finalist group. High performance teams are made up from high performance people and great managers know finding the right candidate is often a difficult and time consuming process. Managers want to select people who will be a good fit for their organizations, are able to do the job well, and need minimal supervision. In this article I will introduce a process that will show you how to achieve your hiring goals faster and with less effort than you’re probably applying today. Several years ago I had a choice assignment as American Airlines’ sales manager in Los Angeles. My team had multiple openings for account managers and I posted the positions on AA’s internal career site. It was common for nominally qualified applicants to receive an interview in-person. Since the rest of the country was buried under an unusually harsh winter the candidate list grew to more than thirty people in the first week. This created an enormous opportunity to design an efficient process that could uncover hidden talent since I needed to reduce the candidate pool substantially before inviting people to meet face-to-face. Requirements: create an ‘interview’ screen to evaluate as many candidates as possible to minimize problems caused by rejecting internal candidates who’s current management team viewed him or her as well–qualified. Next, ensure the filter would provide each candidate an opportunity to showcase their skills and experience, but eliminate the standard thirty minute or hour-long interview call. Furthermore, the process should stratify candidates and generate a clear threshold to determine if a follow up interview would be necessary. And finally, include other team members to secure their buy-in and support for the new employees. Detailed overview about the position, and qualities and experience expected from an ideal candidate. Current team members would share information about their experiences. Hiring manager and team would answer candidates’ questions. Round one – Answer three questions. Candidate responses should be returned via email within two hours. The first-round conference call was effective – over thirty percent of the applicants dropped out before the call, many because they were not invited to attend in-person. Several more declined to move forward following the call and either decided the questions were too much work or they were not as qualified as they initially hoped. We even received calls from other managers who told us their employees were impressed by our process – many were confident they knew more about this opening than any position they had applied for previously. As responses arrived I pasted them into an email and assigned each candidate a number (a blind evaluation works well to minimize bias when candidates are known to other team members). Once the complete list was ready I sent it to the team and asked each of them to rate candidates by choosing: Yes, No, or Maybe to answer the question – should we interview this candidate further? This simple stratification led to remarkably clear results. The top three candidates received a Yes from all six evaluators, while the bottom nine candidates received a No from most evaluators. The “Maybe’s” fell into two groups – those who split between “Yes” and “Maybe”, and those split between “No” and “Maybe”. In the span of five business days the position moved from a ‘closed’ status to a short list of finalists; it effectively allowed me to interview twenty-five people with four hours of work, and dramatically reduced the number of face-to-face interviews. You shouldn’t underestimate how much you can learn about a person from a written response to a simple question, trust me. Furthermore, it gives you an effective way to offer candidates feedback about their performance. This solution revealed other norms that have held up since my first experiment. Top candidates respond within thirty minutes. Their answers are usually weighted to the lighter side in word count, but content wins and their stories are laser sharp. Many poor answers are returned quickly too, but additional time does not seem to improve a particular candidate’s chances. How much is the monthly rent for a home you’d be willing to move to in Los Angeles? Finally, some candidates will not be available for the call on short notice, or you may need to add someone to your list after the initial call. Easy fix, simply record the call, and as people are added tell them to let you know when they have three hours free (one hour for the call, and two hours for the questions), then send them a link to the recording and require a response three hours from the time you send it. Technology does the heavy lifting and saves you time. Great candidates can pass through any filter because they have the sharp skills, business acumen, flexibility, and communication gifts required to articulate a tailored response to “Why you and why this job?” During the past three years I have applied this process to almost a dozen employee searches with the same effect. High performance teams are collaborative-they give everyone a voice and they depend on emotionally healthy, intelligent, mature, hard-working, value-driven employees to generate the championship results that set them apart. I hope you can put this experience to good use and reduce the time and energy you put into building a better organization.